DNA MX Factory replacement air filters are designed to increase horsepower and acceleration while providing excellent filtration. These filters are washable and reusable and are custom designed to fit into your existing factory air box. Their drop-in design means adding performance is simple.They offer bigger air-flow, with almost 99% filtering efficiency. It's ideal for Honda CRF 450 R.
Billet marine grade aluminum CNC machined removable top for easy installation. EVA factory installed high quality precisely cut gasket for perfect sealing. Flexible frame that adapts easily to the OEM air box. Large surface and increased air flow over the typical foam filters. Filtering efficiency that is extremely high and suitable for off-road use (98-99% filtering efficiency, with 4 layers of DNA Cotton). The flow of this New DNA MX Factory Series filter is 24.00% more than the Honda stock foam filter! 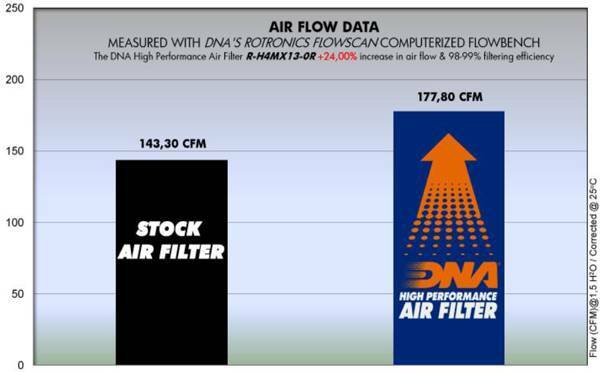 DNA MX Factory Series air filter flow: 177.80 CFM @1,5"H2O corrected @ 25degrees Celsius. Honda stock foam filter flow: 143.30 CFM (Cubic feet per minute) @1,5"H2O corrected @ 25degrees Celsius. 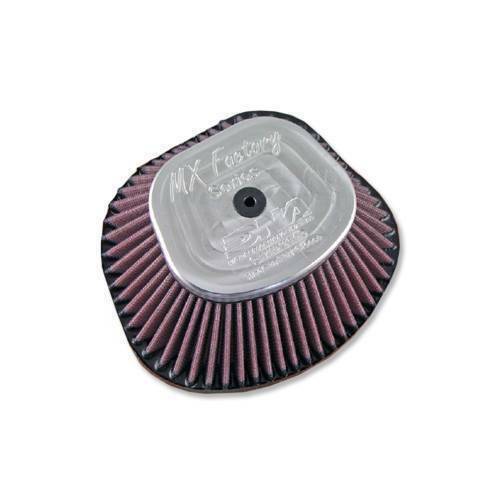 This DNA MX Factory filter is designed as a High flow air filter for Off-road & Super-Moto Racing use.